MC2=E. Mass in any form is composed of energy. Quantum physics shows that as you go deeper and deeper into the workings of the atom, you find there is nothing there – the atom is in fact an invisible force field, a kind of miniature tornado emitting waves of electrical energy. Answer: energy, rhizomatous in every sense, having no beginning and no end, comprised not of units but of dimensions, or rather directions in motion. MC2=E encourages spontaneous interaction i.e. a person may climb onto the boulder or sit under the tree and become part of the installation – tree and human = energy or energy = tree and human. Just as the rhizome the installation is always reversible, modifiable and has multiple entranceways and exits. 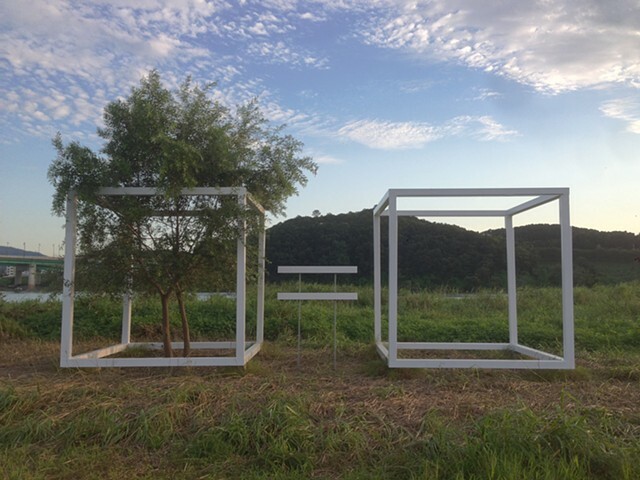 The cube containing nothing (energy) highlights the rhizomatous essence of nature as it connects any point to any other point regardless of any perceived differences in their traits – nothing is the source of everything.